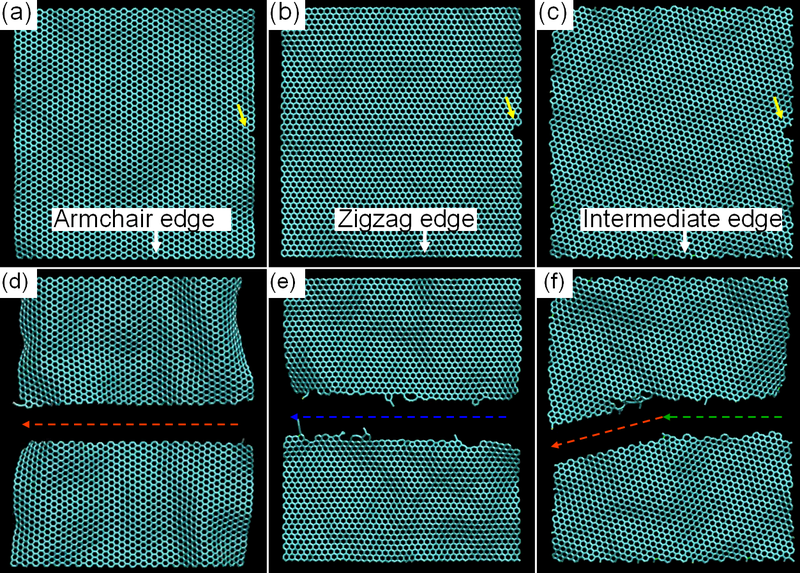 This is a joint paper where we work together with experimentalists to explain unusual observation of tears in graphene going almost exclusively in the zigzag or armchair directions of the crystal lattice (Fig. 1), using fracture theory and molecular dynamics simulations (Fig. 2). Fig. 1. 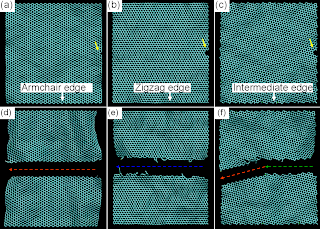 A crack in graphene as seen in a transmission electron microscope and the distribution of cracks by orientation with respect to lattice (zigzag is blue and armchair is red in the left panel). Fig. 2. Snapshots from MD simulations showing straight crack propagation in the armchair and zigzag orientation and crack redirection when started at an intermediate orientation with respect to the lattice. I am a computational chemical physicist presently working at the ME&MS Department of Rice University. My main subject area is nanotechnology, but I'm also very interested in other aspects of molecular simulation, particularly, computational molecular/material design. My publication list can be found here, and an online CV can be found here.